Paul moving faster toward the coast of southern Baja California. Landfall expected this afternoon. 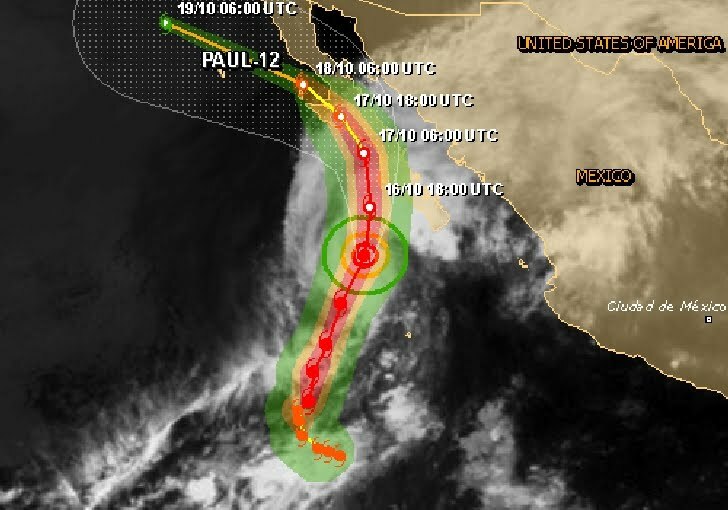 At 05:00hr PDT the center of Hurricane Paul was located near latitude 22.9 north/longitude 112.3 west, about 210km / 130mi S of Cabo San Lazaro Mexico. Paul has accelerated and is now moving toward the north-northeast near 33 km/h - 21mph. On the forecast track the core of the hurricane will make landfall within the Hurricane Warning area this afternoon. A turn to the north with a decrease in forward speed is expected on Wednesday. Maximum sustained winds are near 175 km/h - 110mph with higher gusts. Paul is a category two hurricane on the Saffir-Simpson hurricane wind scale scale. Little change in strength is expected prior to landfall followed by weakening after landfall. Preparations to protect life and property should be rushed to completion. Wind: Tropical storm conditions are expected to begin in the Hurricane Warning area within the next few hours...with hurricane conditions arriving early this afternoon. Tropical storm conditions are expected to spread northward along the East Coast of southern and central Baja California later today through early Wednesday. Tropical storm conditions are possible within the tropical storm watch area on Wednesday. Rainfall: Paul is expected to produce total rain accumulations of 2 to 4 inches over the southern Baja Peninsula...with possible isolated maximum amounts of 8 inches. These rains could produce life-threatening flash floods and mud slides...especially in areas of mountainous terrain. Storm: A dangerous storm surge is expected to produce significant coastal flooding along the coast of southern and central Baja California in areas of onshore winds. Near the coast the surge will be accompanied by large and destructive waves. Swells generated by Paul will continue to affect the West Coast of Baja California for the next day or so. These swells are likely to cause life-threatening surf and rip current conditions.